Following the digitization of 90 works by the great writer, Leo Tolstoy, an iOS app will soon appear based on his wife’s cookbook. 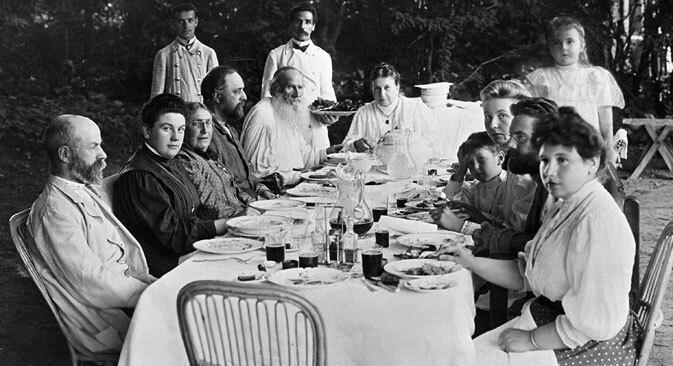 RBTH explores the Tolstoy family’s culinary traditions and the cultural significance of their food. The most celebrated dish in the home of Leo and Sophia Tolstoy was Anke Pie with lemon filling. It was named after Dr. Anke, a friend of Sophia’s mother, who passed the recipe on to her family. “Ever since I can remember, all festive occasions, big holidays and name days were always and invariably celebrated with Anke Pie. Without it, a meal wouldn’t have been a meal, and a feast wouldn’t have been a feast,” the Tolstoys’ son, Ilya Tolstoy, wrote in his memoirs. Sophia A. Tolstoy’s cookbook, now available as an app, is more than just a compilation of family recipes. A look into the Tolstoy kitchen provides a deeper understanding of the writer, with all his strivings and contradictions, and the rich customs that he both embraced and rejected. While leafing through the book, one realizes that “the whole life of the family was filled with simplicity and sincerity,” said Olga Syutkina, a historian and scholar of Russian cuisine, who offers commentary in the upcoming print edition of the cookbook. 1 wine glass of water. Butter straight from the cellar, to ensure it is cold. grate the zest of 2 lemons; squeeze 3 lemons. Boil until the mixture becomes as dense as honey. Some readers may find the prevalence of French cuisine rather grand: "French cooking is characteristic of the later 19th century in Russia: Just look at some of the dish names in Sofia Tolstoy’s cookbook: apples à la Dophine, green beans à la maître d’Hotel, sauce pomme d’amour, and chicken à la majonaise", Vronskaya says. The most intriguing recipes are associated with the names of the Tolstoys’ friends and relatives. There are a host of them in the cookbook: Dr. Anke Pie, Bestuzhev Easter Cheese Paskha (close to a cream cheese mold), Marusia Maklakova Lemon Kvas (a traditional fermented drink), Maria Fet Apple Pastila (a delicious apple paste). “For each of these recipes there is an episode, and even a whole page of Russian cultural life,” Olga Syutkina said. baste with egg and bake in the oven. Leo Tolstoy, the undisputed head of the household, underwent a spiritual turning point rather late in life. The family’s way of life, previously viewed as exemplary, became alien to Tolstoy. And of course, that impacted the food. In the last 25 years of his life, Leo was a vegetarian in his moral and philosophical beliefs, although he did eat dairy products and eggs. Sophia did not support Leo in his newfound views, but she started to order two lunch options from the chef: meatless for her husband and daughters, who followed his example, and meat dishes for herself and her sons. She was constantly preoccupied with how to improve the health of an already very aged husband and what to feed a person who was suffering not only spiritually – haunted as he was by the disparities in the social system – but also physically – from weak digestion. “It is difficult to feed him, a vegetarian, when he is ill. You take pain to invent dishes. Today I gave him soup with rice, asparagus, and artichokes in mushroom bouillon, porridge in almond milk and a boiled pear," she writes in her diary in 1897. “Mom always made sure that dad's food was light, and she raised the topic of nutrition almost to a cult. Chef Semyon Nikolaevich went to her every evening, and they discussed the menu for a long time," the Tolstoys' youngest daughter Alexandra recalled. According to Alexandra, the soup intended for the writer was not always completely vegetarian. If Tolstoy fell ill, his wife and chef Semyon conspired to add beef bouillon to the mushroom version. Now tourists can try food a la Tolstoy, including Anke Pie, at Yasnaya Polyana, where special attention has recently been given to reviving this great family's gastronomic traditions. In August, a gastronomic tour was launched, and it is already popular. The cookbook, a museum initiative, will be available to Russian speakers in two versions. The complete 162 recipes, along with commentary by historians, researchers, and culinary specialists, will be published in print, and an abridged version containing about 50 recipes, also with commentary, will be available as a free iOS app on Nov. 1. There are also plans for an English version. According to the project's coordinator Yulya Vronskaya, all of the recipes have already been translated, and the museum is currently seeking funding to launch the English-language app. Editor's Note: The pounds are Russian pounds — 400 grams. The translation is as close to Sophia Tolstaya's writing as possible (for example, "butter straight from the cellar") so some interpretation may be involved. Happy Cooking!